A trend swept through Ireland in the ’80’s leaving us innocent and dreamy city girls who read everything in the local library, fodder for the future farmers of Ireland. The trend was country and it’s leader was Alice Taylor. Alice Taylor, and don’t get me wrong, the lady is still a hero of mine, has a lot to answer for. I ravished her books like a grass starved heifer; Longed for the day when I would inherit an auntie’s tea set for Stations, bought all she was selling on the frolicking through the countryside front, and so, fed on a diet of “To School Through the Fields,” my lovely farmer SAW ME COMING. No amount of literary loveliness could prepare me for the drudgery of cooking the dinner. Don’t get me wrong, I love to cook and I have to admit am pretty good at it, not surprising considering the amount of practice I get. I’m not even talking about the scary silage dinners, nope, just your everyday dinner. I know my city sisters are equally afflicted because let’s face it, no matter how many exceptions you are going to throw at me, we girls do the majority of the cooking. A hangover from a past life living as a student in France and Italy has left me pernicky about cooking from scratch, always on the look out for good ingredients so mea culpa, I’ve asked for it. I still have the same ten things I make over and over but I like to know that in the half an hour I allot myself for cooking the dinner, it is well made and tasty. But it’s the everydayness of it. Luckily, I’m not even dealing with fussy eaters (though they do cross the threshold on occasion), I’m talking about the routine of it. Farmers by nature are creatures of habit. It took me six torturous months to get my man out of eating his dinner at one o’clock. And that was only because it suited our family timetable better (see I’m still trying to justify it). Added to this, the men (often two but it can be more), take off their wellies and sit down to eat as formally as they ate in the ’50’s. So I find myself serving food up to men, who in fairness, come in from difficult labour themselves to rest their weary bones in my dining room for a while. And so it falls to me to give them a decent meal and send them on their way. It’s the setting the table, putting out the cups of milk or water, handing out the dinner, making the tea and biscuits or the odd dessert that make the whole process a bit of an ordeal. I have tried on occasion to make it easier but nought has worked thusfar. My latest endeavor has me roping in the children to help out. ‘Philip the table!’, ‘Daniel the cups!’, Just in the last week, Philip who will go along with any make-believe adventure has come to answer to ‘service’ if I cast him as the waiter! Lately, I did reread my well-thumbed “School Through the Fields” and did find hints of the drudgery in amongst the fields and I realize now, that my younger self was blissfully unaware (as one should be at a young age) of real-life down on the farm. 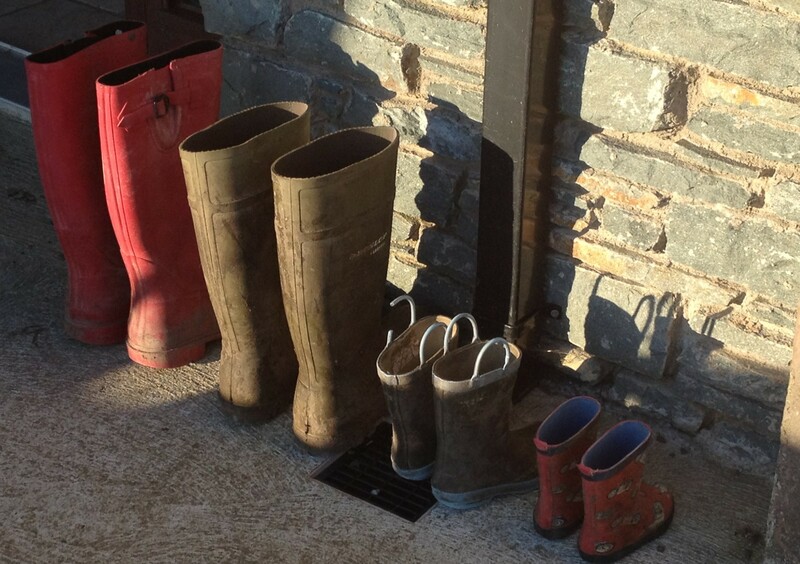 For better though, farming households throughout the country are changing and the mealtime routine that for many years was set in stone is now evolving to suit today’s farming family. Alas, for this girl in wellies, for a while longer, I remain for the most part in the heart of my kitchen dreaming up new ways to make mealtimes easier. Garçon! This entry was posted in Food and tagged farming dinners on February 26, 2014 by annebennettbrosnan.